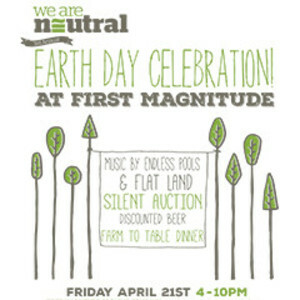 Come join us at First Magnitude Brewing Company from 4pm - 10pm the night before Earth Day, Friday, April 21st to celebrate your love for the earth, bid on silent auction items, and connect with local organizations.Enjoy a Farm to Table Dinner from Fables Catering and Such, discounted beer, and music by Flat Land and Endless Pools. This is a family-friendly, rain or shine event! We are excited to host our third annual Earth Day Celebration at First Magnitude Brewing Company! Agenda:4pm Doors Open5pm Julien Kozak6pm Dinner by Fables Catering & Such8pm Endless Pools9pm Flat LandGet your ticket now at https://weareneutral.yapsody.com/event/index/79266?ref=elinkAll proceeds of the event will benefit We Are Neutral, a local non-profit organization. We Are Neutral believes that we are too damn creative, resourceful, and competent to accept the current state of this planet. That's why we seek to connect everyone to a better way of doing things. We do this by establishing industry leaders with our meaningful community-based carbon offsets, carbon reduction projects, education and messaging.